Common Red Soldier Beetle "Rhagonycha fulva"
The Common Red Soldier Beetle is also known as the 'Bloodsucker' for its striking red appearance, but it is harmless. It is a beneficial garden insect as the adults eat aphids, and the larvae eat other pests. 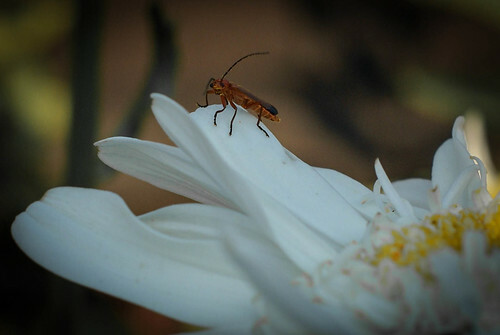 The Common Red Soldier Beetle is a medium-sized, narrow beetle commonly found on open-structured flowers, such as daises, Cow Parsley and Hogweed, during the summer. It can be spotted on grasslands, along hedgerows, and in woodland, parks and gardens. Adults feed on aphids, and also eat pollen and nectar. Larvae prey on ground-dwelling invertebrates, such as slugs and snails, and live at the base of long grasses. The adults spend much of their short, summer lives mating, and can often be seen in pairs. Soldier beetles are so-named for their various combinations of black-and-red markings, which are reminiscent of a soldier's uniform.